High class football and a great surrounding event can be expected at the eXess EFAF-Cup Final between the Turek Graz Giants and the Eidsvoll 1814's. Saturday, June 8th, ASKÖ-Stadium Graz-Eggenberg, Kickoff: 03.00 pm, Gates to the Party Zone open at noon. The Giants' staff has only good things to say about their opponent. "Eidsvoll is a very decent team. Especially Quarterback Joe Brannen really stands out. He is properably the best one we've seen all year." says an impressed Giants Coach Phil Maas. Eidsvoll has secured their third National Championship in a row last Saturday. Giants-Manager Schubert: "The club is the by far the best team in Norway and could properably compeate well in the Austrian Football League." Another great game, just like the one played between Giants and Dodge Vikings last weekend seems to be possible. Graz players have to leave the shocking 27-28 defeat against the Europe's top team behind. Vienna rallied late in the fourth quarter and when time ran out completed a 50-yard hail mary pass to win the game. Giants WR Armando Ponce de Leon: "We lost, but this game was good for our self confidence. Now we know for sure that we can beat every team in Europe." "We really want to put up a great show for the fans." Giants Manager Schubert says. "Spectators should arrive a bit earlier, otherwise they'll miss some of the pregame action." The party zone opens it's gates at noon. Besides face painting, several concession stands with fingerfood and cool drinks the biggest austrian football shop will be present. There are several great prices to be won at a lottery, including a minibike and three Peugeot convertibles for one weekend. 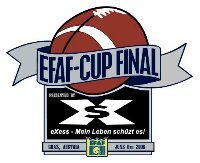 The eXess EFAF-Cup Final is the third apperance in an EFAF Bowl for the Turek Graz Giants. The Giants have won the EFAF-Cup in 2002 and finished as the runner-up in the 1998 Fed-Cup, the forerunner of the EFAF-Cup. Austrian Broadcaster ORF will have a live broadcast of the game on ORF Sport Plus, a channel that can be seen all over Europe. The broadcast starts at 1.30 pm. There will also be a two hour broadcast of the game on national televison ORF 1 at night, starting at 1.15 am. Commentary: Niki Gutmann, ORF and Tino von Eckart, former Headcoach of Team Austria.